In September 2014, just in time for the autumn apple season, the nearly two-year-old Schilling & Company cidery opened Schilling Cider House, a bar near the bottom of Fremont Avenue that carries hundreds of bottled ciders and 32 ciders on tap—including, of course, the cidery’s own dry-hopped hard ciders, made with Washington apples. 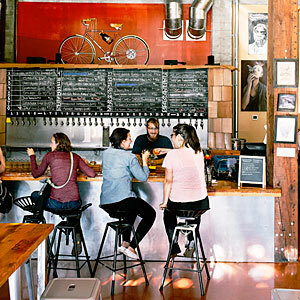 Dating back about 100 years (note the gleaming Douglas fir tables, salvaged from a torn-down wall), the cavernous space serves as Schilling’s taproom; it also houses a cider growler-filling station. (Although refilling growlers with beer has been legal in Washington for ages, the state passed a law allowing cider growlers only in March 2014.) Be sure to try Schilling’s ginger cider—it’s spicy, which is only appropriate, given that owner Colin Schilling’s great-greatgrandfather started the Schilling Spice Company.